This bi-monthly periodical features mission-centered stories and articles by authors from NALC, CALC, LCMC, Lutheran CORE, and others representing biblical Lutheranism. Written for everyday evangelical Lutheran Christians, the magazine is filled with meaty articles as well as lighter spiritual fare, providing great food for the soul. Each issue features Bible studies, devotional readings, missionary stories, articles on domestic ministries, full-color art and pictures, and regular updates on what is happening in NALC, LCMC and Lutheran CORE, along with other confessional Lutheran organizations. Issues of the magazine are published six times a year. 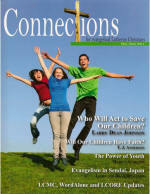 Articles and features in Connections magazine are contributed by biblically orthodox, evangelical Lutherans from various denominations in North America and around the world, with a distinctive mission focus. Get to know some of the leaders, teachers, missionaries and agencies working together in the new Lutheran landscape. To order an individual subscription, go to: www.solapublishing.org or call toll free: 1-888-887-9840. Reduced rates are offered on group orders. To set up a congregational subscription, contact Kay Groethe by email, or by telephone at 218-731-0662. View our Educational Resources page.